Let's consider two approaches to the Bible, both of which are found in the Bible. The Old Testament approach is about being protected and loved and cared for. The message of Moses was that as long as you follow the Law, you will be protected and cared for by the Provider, by any means necessary. There is of course debate within the OT about this. Many of the prophets claim that the reason the people were suffering famine and sickness and the ravages of war was because they were unfaithful. Other books such as Job or the Psalms claim that the system was not working as they were being faithful and were not being protected. Those same Psalms therefore call out for God's violent retribution, saying in essence "Protect me, the righteous victim, and give the bad guys what they deserve!" Now, I want us to notice that this is not simply a story-line found in the Old Testament. It is one that has endured for centuries across many cultures, and one that we still largely embrace today. You could say that this is our national narrative in America. You will find it rehearsed over and over again in our movies and TV shows, and proclaimed by our politicians both red and blue. The focus is on us and our safety, and if the "bad guys" need to suffer in order for us to be safe and happy, well they must deserve it. In contrast, instead of a focus on self--a focus on our safety and well-being--the focus of the New Testament is on others, and especially on those who we esteem as the least deserving and the least valuable and the least moral. Especially how we treat our enemies, especially how we treat sinners, especially how we treat the "bad guys" reveals how we treat Jesus. To some extent this focus on care for the widow and orphan can be found among the OT prophets, but usually with the idea that God would violently destroy the oppressors, thus protecting the victims, rather than claiming, as Jesus did, that God is our example of enemy love. Here Jesus takes the message of compassion begun by the prophets to a place they never went. That is, the NT is a response to the OT, acting as an inner-religious critique which Judaism had a long and healthy history of, a call by Jesus to reformation of his Jewish faith, taking it to a deeper level not focused on the welfare of one people or nation vs. others, but a message of redemption for all people. Paul's expression of this good news for all people in the book of Romans can by summed up like this: His religious audience, seeing themselves as victims, longs to see the bad guys (the Gentiles) receive God's wrath and retributive punishment. This is the Old Testament narrative, and the focus is on avenging the righteous victims. Paul's argument is that we are all bad guys, and so what we all need is restoration rather than destruction. Destruction is not something you should wish on others, because since we are all equally guilty, we would be wishing that on ourselves. Instead, what we need to wish upon everyone, including ourselves, is God's restoration. That, Paul argues, is the justice of God--not a justice of destroying, but a justice of restoring. That's what God was doing in Christ. That's the way of reconciliation. That's the gospel. Now, we might be tempted to think at this point we could just read the New Testament and disregard the Old. In some respects this may be true. The NT does take things higher than the OT, in the way 2.0 goes beyond 1.0. However, what is far more important than what we read is how we read it. 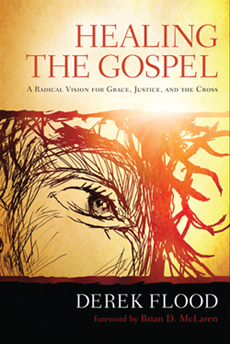 We need to learn how to read with the social focus rooted in compassion that Jesus taught. If you instead read the New Testament with a focus on self, with a focus on you being loved, and you being forgiven, as opposed to you forgiving others and you loving others, you can end up missing the entire point of the New Testament. Despite how pious it may sound, the focus of Jesus is not on my salvation, my forgiveness, or on me being accepted. Yes, all those things matter, but I am loved so that I can in turn love others the same way Jesus has loved me. My forgiveness needs to result in me repenting of my self-focus and learning how to love. It is vital that we learn to love ourselves, but we can't stop there, and if we do, we stop at a place where it is all to easy to justify violence towards others. That was Luther's mistake, and Augustine's. It has been the mistake of many good people. What's crucial to understand is that this focus on self is not about being a selfish hedonist sinner, it is at its heart a pious focus. It is a focus which sees itself as good. Because of this pious focus on self, Christians can read the New Testament and see it as focused on personal salvation, ignoring its core focus on enemy love and social justice. 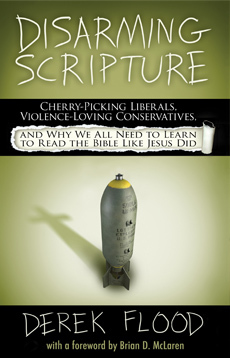 This pious self-focus leads people to read the New Testament in a way that makes Christianity the impotent chaplain to empire, missing the radical challenge to empire found in Jesus' message of the kingdom of God and in the very act of proclaiming Jesus as Lord (this applies not just to the Roman empire, but also to American empire). The call of Jesus is a call to turn from a self-focus (including a nationalistic focus of "us" as opposed to "them" which characterizes much of the OT, and characterizes our country's national rhetoric), and to instead embrace a relational social focus that especially cares for those we love the least. It is a focus of compassion. If we can read the NT with that social focus rooted in compassion, then we will find a feast. However, it is equally possible to read the NT with a focus on self and us/them thinking (which we naturally gravitate towards), and miss the whole thing. You will end up underlining and highlighting just the parts that are about your comfort and assurance, and skipping over all the hard parts that show us how to walk in grace and forgiveness and love like Jesus did. When we think the whole point is about us, then it is extremely easy to justify hurtful actions as "collateral damage" on the road to our happiness. I've said that we need to learn to read the Old Testament like Jesus did, focusing on the parts that call us to compassion. But we all the more need to learn to read the New Testament, and the words of Jesus, with the focus of Jesus, which is a relational focus rooted in compassion. We need to learn to view all of life through that lens. It's not so much what you read, but how you read it. Lord, give me the eyes to see myself and others as Jesus did. This is wonderful Derek. You make a very sharp contrast between selfish and selfless. Jesus was a *man for others* i would like you to expound upon the issue that creates strong tension. When it is said that unless you believe in Jesus, you have no salvation. There are many passages as you well know which are interpreted to make this separation- believers and unbelievers. How do you take what you are saying here and show God and Jesus love ALl even those who don't believe in Him as Lord and Savior?? I am a *hopeful universalist* and so wish to have more clarity on what to say when people refer to this and act as though yhou are the devil for even contemplating universal salvation. "the impotent chaplain to empire..." Whoa! I love that phrase. Like Robert, I too am a hopeful universalist looking for help to show that God loves all. How do we lead those with the Bible-thumping-us-and-them-mentality to a more inclusive and generous outlook? Since the common language of conversation within the body is Scripture, we need to develop a compelling Scriptural case to compliment the moral imperative. A teamwork discussion to make such a case could be a rewarding effort. Consider the story of the sheep and the goats. They proclaimed Jesus as "Lord" but still went to hell. Why? Because they failed to love the least. Consider the story of the unmerciful servant. He had been forgiven by God (the king) but went to hell. Why? Because he failed to forgive his brother. Pretty much every time Jesus speaks of hell, the focus is, again and again, on loving others. Hell is presented as a threat, saying "do this or else this bad thing will happen" and the thing we are told we must do is to love others. Moreover it is stressed that calling Jesus Lord or being forgiven by God or anything else like that (saying the right prayer, having the right doctrine, the right religion) is meaningless if we fail to love. Practice enemy love and radical forgiveness towards those you regard as sinners and enemies or you will burn in hell. That was pretty much exactly Matthew's approach. It's re-framing. We begin with a familiar concept (hell) and re-frame it to say that those who will go there are not "them," but you (the religious insiders) unless you learn to love. So repent of being so judgmental and wrath-seeking, and get with the program. The audience here are not the "sinners" but the religious. Derek- good start there. Like Steveo i too would like a teamwork discussion so hope more comment. How would you deal with the Scriptures that declare Jesus is the only way to salvation??? Hebrwes says He is the sole mediator between God and man,When asked what they must to be saved to peter he said believe in Jesus Christ, many other references as well. Do you have a clear response to any and all who would hold that anyone, no matter if they ever even knew about Jesus in their lifetime, would not be saved because ONLY by Jesus can they??? This ends up, to me at least, being pretty much the major obstacle when talking about universalism. The references about hell can be dealt with by showing hell is a wrong translation of gehenna and was never what Jesus meant. It's a legitimate thing to discuss, however it seems kind of off-topic here. Maybe we could do that somewhere else? Here I'd like to stay focused on the topic outlined in my blog post, which is that the main focus of the NT is not one of individual salvation, but rather a focus on caring for others. I think in the big picture we need to learn to focus more on that since that is the focus of Jesus. How about we love the hell out of THEM as God loved the hell out of us? It's really funny... I was about to mention the Goats and Sheep parable in my post this morning but thought it not appropriate because it feeds into that us-and-them-mentality, in fact I've heard it used that way. And I thought I read something from you Derek that we could think of this parable in a more humble way than drawing lines between the saved and unsaved. Rather, we could pray, "Lord, purge the goat out of me," as we rest secure in the finished work of Christ. But I guess I read that elsewhere. I certainly agree that the scope of the salvation of all mankind could be a distraction to "Jesus and Empire." But to say "what we all need is restoration rather than destruction" while ignoring the historic Christian teaching that we're all headed for eternal destruction... Well it just seems so incongruous. Isn't the entire notion of God being actively involved in eternal torment a reflection of "The Old Testament Approach?" Is eternal destruction merely the collateral damage of having free will? It's just collateral damage, nothing to dwell on here, these are not the droids you're looking for, move along. I really like the Rebel God, but I long for more rebel Christians coworkers to help heal the Gospel. Derek while I think your boiling the OT to such a simplistic concept of "protect us, hurt them for hurting us" is a bit much, I find it refreshing nonetheless. If the NT focus is lost in self focus, your message of "yes, you for others" goes a long way! The charismatic church has almost the same message but is lost in the application as are the Baptists. One says it is all God touching people through charismatic gifts and the other is all about salvation for others. Evangelicals get lost in the "it's for you" message, we like individuality and your off the hook messages. But the "so what" part of your message that I love is "blessed to bless, forgiven to forgive, cared about to care about.". When the end product is people who care more and demonstrate caring day in day out. I know you are on the right track. Does the message help us to see ourselves better so we can be better? I think it does. It attracts universalists because I believe real truth seekers are drawn to Jesus because Jesus spoke of the more weighty matters of life and unless we get distracted by culture politics and theological controversies, we find Jesus caring about people and the sea of hurting humanity and it compels us to want to follow Him. I dunno. Derek wrote a great piece on hell, that talks about the God who agonizes over the value of people and how God responds to pain. It's in the archives. Maybe it will help clarify some stuff.